The TTABlog®: Fame of "POST-IT" Mark Yields 2(d) Opposition Victory over "FLAG-IT!" Fame of "POST-IT" Mark Yields 2(d) Opposition Victory over "FLAG-IT!" Opposer 3M stuck it to Applicant Professional Gallery, Inc. in this opposition to registration of the mark FLAG-IT! for "adhesive-backed labels; adhesive-backed plastic film designating signatory action." 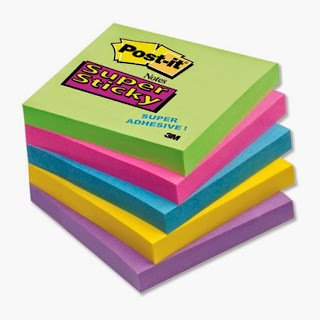 The Board found the applied-for mark likely to cause confusion with the registered mark POST-IT for various stationery products, including note pads containing adhesive on one side of the sheets for attachment to surfaces. The fame of the POST-IT mark was the dominant factor, with the Board rejecting applicant's principal argument that the marks are not confusingly similar. 3M Company v. Professional Gallery, Inc., Opposition No. 91173411 (July 17, 2014) [not precedential]. Fame: 3M began using the mark POST-IT for sticky note pads in 1980, expanding the product line in 1987-88 to include adhesive flags. Annual sales of these products have been substantial and 3M is the market leader in both product areas. It spends millions of dollars per year in promoting these products and the brand has often been mentioned in unsolicited media coverage. The Board had no doubt that POST-IT is a famous mark for sticky notes, and it concluded that because sticky flags are so similar, that fame "spills over onto POST-IT for flags." Of course, the fame factor carried heavy weight in the du Pont analysis. The Marks: Because the goods of the parties were found to be legally identical, a lesser degree of similarity between the marks is needed to support a finding of likely confusion. Furthermore, the Board must presume that the goods travel in the same, normal channels of trade to the same classes of consumers. Applicant adhered to the argument that the differences in the marks make confusion unlikely, particularly in view of the weakness of the "IT" suffix. It (applicant) pointed to more than 100 third-party applications and more than 1,200 registrations for marks containing the element "IT." The Board found most of this evidence "not particularly probative" because applicant did not prove that the marks are in use or that the public is familiar with them. Moreover, few of those registrations involved goods similar to the products involved here, and even when the products were similar the Board was unable to conclude that "it" has any significance with regard to the involved goods "other than as an indefinite pronoun that, when combined with a verb, indicates that 'it' is the recipient of the action." Third-party website pages likewise failed to convince the Board that consumers will distinguish the mark FLAG-IT! from POST-IT when used on identical adhesive flags. Many of the goods were not similar to the goods involved here, and some of the marks themselves were not similar to applicant's and opposer's marks. Although Applicant has submitted hundreds of webpages from various websites, in point of fact there are only a very few webpages that can be regarded as showing the use of similar marks on even arguably similar goods. Further, there is no evidence of third-party marks ending in IT for sticky notes or flags. The Board also noted that 3M has had some success in policing its mark vis-a-vis a number of third-party marks. And so the Board concluded that applicant "has not demonstrated that the 6th du Pont factor [the strength of the mark] should weigh in its favor." [Doesn't opposer have the burden of proof here? - ed.]. Comparing the marks in their entireties, the Board found that consumers would consider POST-IT and FLAG-IT! to be similar in appearance and pronunciation. "The beginning elements, POST and FLAG, rather than being seen as identifying separate sources for the goods, will be understood as merely identifying different activities that can be done with the goods." Moreover, 3M has frequently used the word "flag" in advertising its POST-IT products, which "reinforces the connection of its mark with flag." Balancing the relevant du Pont factors, the Board found confusion likely and it sustained the opposition. TTABlog note: I wonder how the FLAG-IT! mark got past the examining attorney? I note that the Board pooh-poohed applicant's computer search results because the results depend on the "logarithm by which the results are depicted." (p.21). Shouldn't that be "algorithm"? Examining Attorneys are not allowed to consider "famous mark" considerations. They are only allowed to look at the four corners of a registration, and sound, appearance, and commercial impression - and any trade limitations in the cited registration and/or application. FLAG-IT and POST-IT are not similar enough outside the famous marks context. The TTAB is the "fame forum" and that's appropriate, because a party should have to demonstrate fame - it should not rest on an Examiner's gut assumption. Even without fame, just consider the marks: POST-IT and FLAG-IT for identical products, used to "post" and "flag" items. Examiners are not going to cite FLAG against POST. Fails the sight/sound test.They are going to look for "FLAG" marks only (which is what is search string consists of). They are never going to get to "POST" from "FLAG." Possibly he could have done an "FL" search in IC 016 or an "IT" search - but that still probably wouldn't have resulted in a citation - there are many many "IT" marks in IC 016 for similar or related goods. TMEP 1207.01(d)(ix) provides that examiners can consider the fame of the prior mark, but only if the evidence of fame is made of record by one of the parties. They aren't, though, required to go out and find it on their own. Seems like a good candidate for a Letter of Protest to avoid the need for a full-blown opposition -- if Chick-fil-A can prevail in having a 2(d) refusal issued on EAT MOR CHIKIN v. EAT MORE KALE, why not POST-IT v. FLAG IT!